doi:10.4236/jbise.2011.44039 Published Online April 2011 (http://www.SciRP.org/journal/jbise/). 2Department of Electri cal Engineering, Malaviya National Institute of Technology, Jaipur, India. 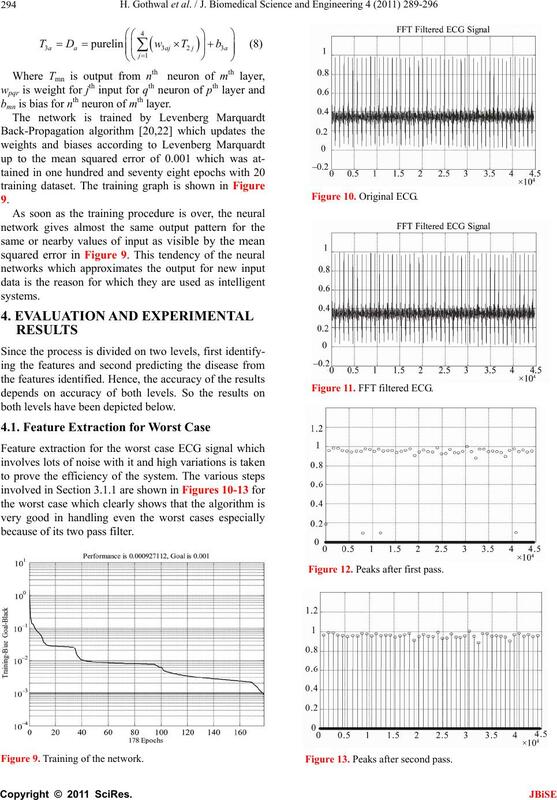 Received 15 April 2010; revised 13 May 2010; accepted 17 May 2010.
training and testing of th e EKG classifier in this project. discusses the problem and various aspects related to it. deals with the results and discussions. works Arrhythmias can be detected efficiently. 300 000 people who die suddenly each year in the U.S.
view of this electrical activity follows. gether represent the total duration of ventricular recovery. 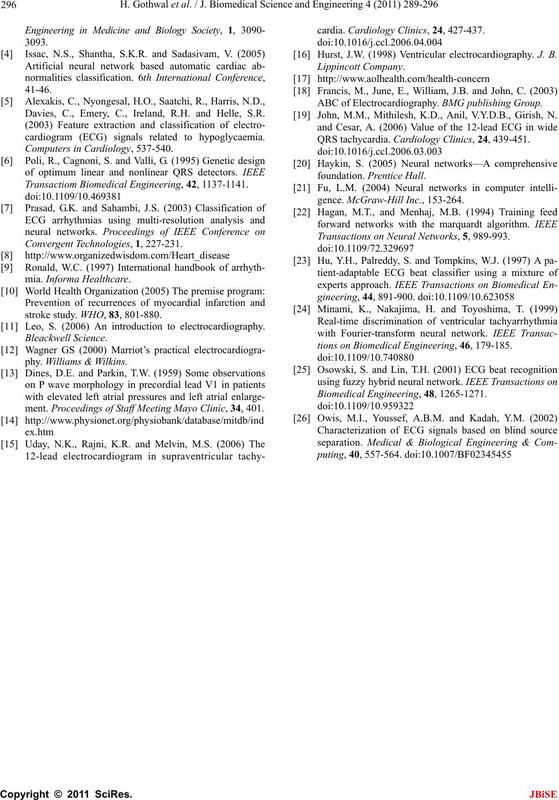 mous patients, collected from 1976 to 1979.
ciently with high accuracy is proposed in this paper. through the same procedure as by training dataset. ral network is applied to train the system. Figure 4. FFT filtered ECG. Figure 5. Peaks after first pass. tected after first pass to the filter is shown in Figure 5. Now the signal is filtered for detecting the R peaks. Figure 6. Peaks after second pass. Figure 7. R-Peaks detected in the ECG signal. sec window before the above approximation. This is to be true for the s window length of 0.05 sec. symptomatic until the rate drops below 50 beat/min. Bundle Branch Block for QRS width > 0.12 sec [11,12]. modifying weights of individual neurons. tors in non linear systems. bmn is bias for nth neuron of mth layer. both levels have been depicted below. because of its two pass filter. Figure 9. Training of the network. Figure 11. FFT filtered ECG. Figure 12. Peaks after first pass. Figure 13. Peaks after second pass. Figure 14. R-Peaks detected in ECG signal. correct input will be given to the neural network. changes are depicted in the Table 1. The solution proposed has an accuracy of 98.48%. Table 1. 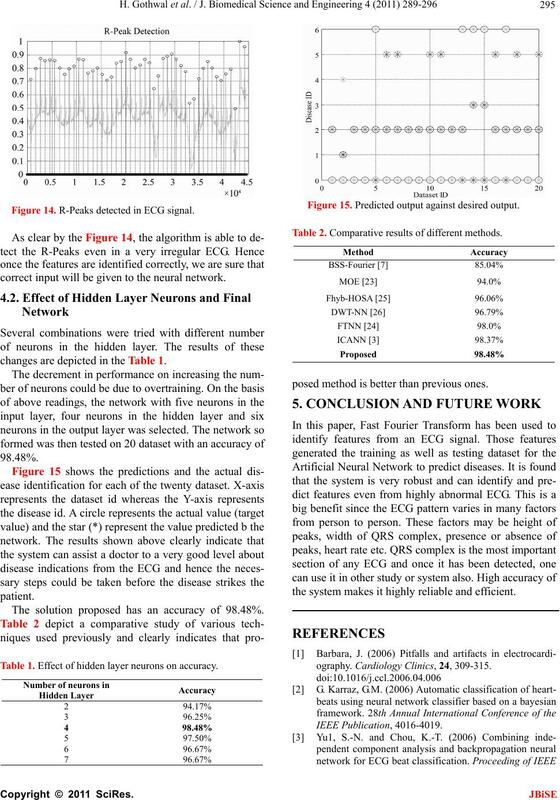 Effect of hidden layer neurons on accuracy. Figure 15. Predicted output against desired output. Table 2. Comparative results of different methods. posed method is better than previous ones. the system makes it highly reliable and efficient. ography. Cardiology Clinics, 24, 309-315. Davies, C., Emery, C., Ireland, R.H. and Helle, S.R. cardiogram (ECG) signals related to hypoglycaemia. Transactiom Biomedical Engineering, 42, 1137-1141. Converge nt Technologies, 1, 227-231.
stroke study. WHO, 83, 801-880. 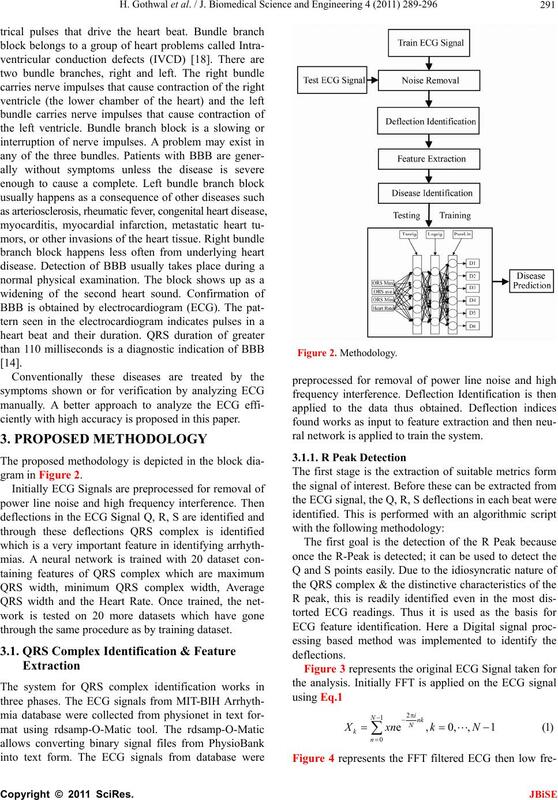 Leo, S. (2006) An introduction to electrocardiography. ment. Proceedings of Staff Meeting Mayo Clinic, 34, 401.
cardia. Cardiology Clinics, 24, 427-437. Hurst, J.W. 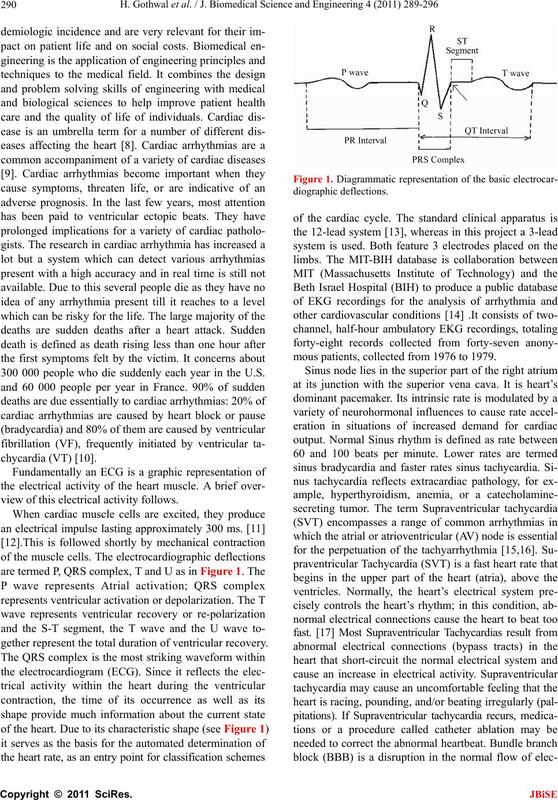 (1998) Ventricular electrocardiography. J. B.
ABC of Electrocardiography. BMG publishing Group. John, M.M., Mithilesh, K.D., Anil, V.Y.D.B., Girish, N.
QRS tachycardia. Cardiology Clinics, 24, 439-451. 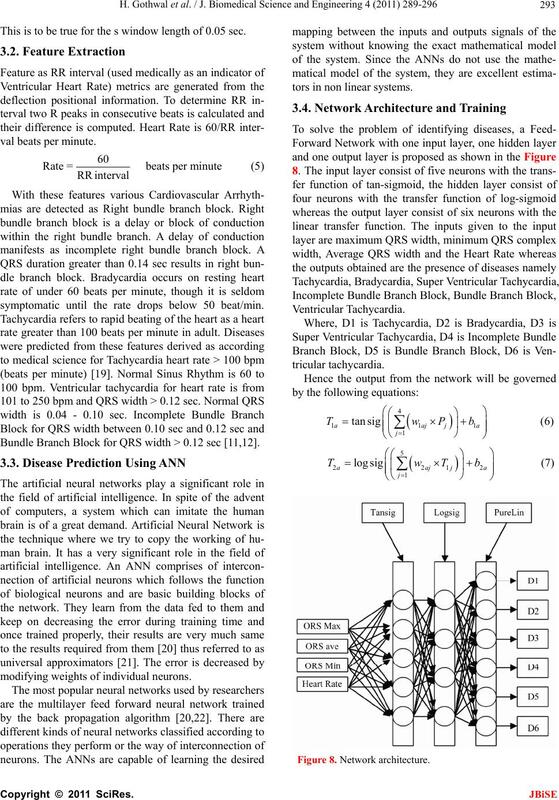 Transactions on Neural Networks, 5, 989-993.
tions on Biomedical Engineering, 46, 179-185.